^ a b c d 岩田昌征 (1999年8月20日). ユーゴスラヴィア多民族戦争の情報像―学者の冒険. 日本: 御茶の水書房. ISBN 978-4275017703. ^ Blaskovich, Jerry (1997). Anatomy of deceit: an American physician's first-hand encounter with the realities of the war in Croatia. New York: Dunhill Publishing. ISBN 0-935016-24-4. ^ Amnesty International. (2005-08-04) Croatia: Operation "Storm" - still no justice ten years on Archived 2007年10月15日, at the Wayback Machine.. Retrieved on 2007-06-12. RSK, Vrhovni savjet odbrane, Knin, 4. avgust 1995., 16.45 časova, Broj 2-3113-1/95. The faximile of this document was published in: Rade Bulat "Srbi nepoželjni u Hrvatskoj", Naš glas (Zagreb), br. 8.-9., septembar 1995., p. 90.-96. (the faximile is on the page 93.). Vrhovni savjet odbrane RSK (The Supreme Council of Defense of Republic of Serb Krajina) brought a decision 4. August 1995 in 16.45. This decision was signed by Milan Martić and later verified in Glavni štab SVK (Headquarters of Republic of Serb Krajina Army) in 17.20. This is the document of Republic headquarters of Civil Protection of RSK. 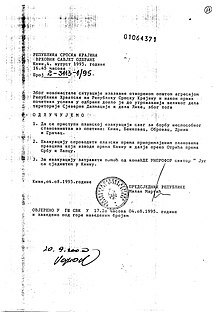 In this document it was ordered to all subordinated headquarters of RSK to immediately give all reports about preparations for the evacuation, sheltering and taking care of evacuated civilians ("evakuacija, sklanjanje i zbrinjavanje") (the deadline for the report was 3. August 1995 in 19 h). This was the next order from the Republican HQ of Civil Protection. It was referred to all Municipal Headquarters of Civil Protection. In that document was ordered to all subordinated HQ's to implement the preparation of evacuation of all material and all mobile cultural goods, archives, evidentions and materials that are highly confidential/top secret, money, lists of valuable stuff (? )("vrednosni popisi") and referring documentations. Drago Kovačević, "Kavez - Krajina u dogovorenom ratu" , Beograd 2003. , p. 93.-94. Milisav Sekulić, "Knin je pao u Beogradu" , Bad Vilbel 2001., p. 171.-246., p. 179. Marko Vrcelj, "Rat za Srpsku Krajinu 1991-95" , Beograd 2002., p. 212.-222.